Help ring in the New Year with this collection of lucky sweet treats. Our special Lunar New Year basket includes an assortment of great local international treats including: Silk Road caramels, crab pate, Walker's shortbread cookies, Urge chocolate, dried cranberries, double chocolate cookies, Luxury and Opulence chocolate, peanuts, almond nougat, truffle pig chocolates, Eves crackers, Poppies cookies, Pineapple cake, cranberry shortbread, Belgian cookies, sesame sticks, Italian pastry cookies and a bottle of BC VQA red wine. 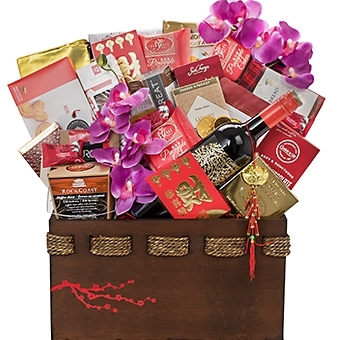 As with all our baskets, the Lunar New Year gift basket is beautifully wrapped in cello with a hand tied satin bow and includes a gift card with your message. All gift baskets on www.pacificbasketco.com are exclusively designed and made by Pacific Basket Company.